The University of Virginia Licensing & Ventures Group has named two winners, an individual and a team, of the 2016 Edlich-Henderson Innovators of the Year, given to University faculty members whose research discoveries are making a major impact on society. John A. Hossack, a professor of biomedical engineering, has focused his research on the use of ultrasound and microbubbles in imaging and drug delivery. His innovative discoveries played a role in three successful startup companies headquartered in Charlottesville. 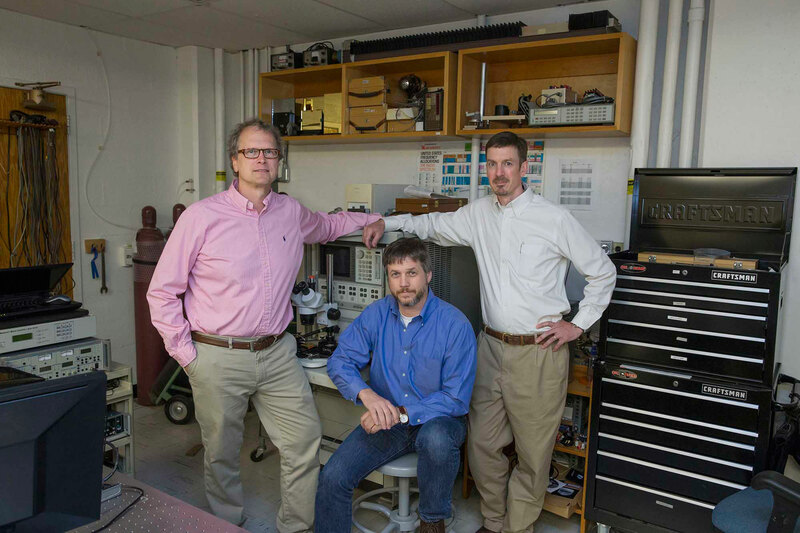 N. Scott Barker and Robert M. Weikle II, professors of electrical and computer engineering, and Arthur W. Lichtenberger, research professor of electrical and computer engineering, respectively, have spent years working on materials, devices, circuits and systems for the measurement and detection of terahertz radiation, or THz. Terahertz radiation refers to frequencies on the electromagnetic spectrum that are invisible to the naked eye and that fall in between microwave and infrared wavelengths. Until recently, the means to detect the tiny wavelengths of THz did not exist. Barker, Weikle and Lichtenberger’s work has practical applications in fields like radio astronomy and compact radar surveillance. UVA has a 40-year history of international leadership in THz technology, including a long-standing collaboration with the National Radio Astronomy and the National Ground Intelligence Center, both headquartered in Charlottesville. Barker, Weikle and Lichtenberger developed a unique THz wafer probe to measure the electromagnetic characteristics of electronic devices and circuits. Their small probe eliminates much of the cost and error associated with traditional methods of THz measurement and allows users to measure higher frequencies. Hossack uses ultrasound technology – similar to a highly scaled-down version of sonar – for cardiac imaging, bone-surface imaging and molecular imaging. He frequently uses microbubbles – tiny gas-filled bubbles in the range of 1 to 4 microns in diameter – in combination with focused ultrasound to allow for localized drug delivery. There is a critical need for such capabilities in cardiac imaging because heart disease kills 610,000 people in the United States every year – one in every four deaths, according to the Center for Disease Control and Prevention. The CDC also reports that on average in the United States, one person dies of a stroke every four minutes. With the use of medical imaging to detect progressive stages of disease, Hossack is interested in examining how microbubbles could help strategically identify damaged tissues and deliver drugs. “The bubbles are gas-filled and are highly responsive to incoming ultrasound,” he said. Microbubbles vibrate in the presence of ultrasound and can cause a transient weakening of the membrane of target cells. The difficult part of drug delivery is to facilitate entry of the drug through the normally impermeable cell membrane. The ideal solution is for the bubbles to briefly weaken the cell membrane just enough to enable the drug to pass through and thereafter allow the cell to fully recover. In 16 years at UVA, Hossack has been involved in 38 invention disclosures that resulted in 10 issued patents in the U.S. and 16 issued patents internationally. His inventions have contributed to the launch of three startup companies: PocketSonics, Rivanna Medical and SoundPipe. In 2005, PocketSonics was created to develop a handheld ultrasound device. In 2013, the company was acquired by Analogic Corporation, which in early 2016 announced its first sale of the Sonic Window for use in patients undergoing kidney dialysis. Former doctoral students F. William Mauldin and Kevin Owen launched Rivanna Medical in 2010 with the goal of commercializing another handheld ultrasound device. In late 2015, Rivanna announced its first sale of Accuro, developed to aid the accurate administration of spinal and epidural anesthesia. SoundPipe, a company developing an ultrasound-based catheter system for the treatment of peripheral artery disease, launched in 2013 and received government funding to pursue additional research and development. Hossack said innovation heavily relies on collaboration between peers, students, technicians, mentors and investors. Barker, Lichtenberger and Weikle began working with a major multinational company through a DARPA grant a few years ago to develop the first terahertz transistor, an international watershed milestone in high-frequency electronics. The transistor is the most important device in electronics and has made modern consumer electronic devices (such as the cell phone) possible. Unfortunately, the speed at which transistors can function is limited. The development of terahertz transistors (which operate about 1,000 times faster than those found in ordinary cell phones) opens the potential for a new high-speed applications in radar and communications. This approach was problematic because it was very time-consuming and, importantly, would not allow for accurate measurements of the targeted device. “We are operating at such high frequency, 100 to beyond 1,000 gigahertz, that every little detail and misalignment has a significant effect in terms of measurement,” Barker said. “This is 100 to 1,000 times faster than the radio frequency electronics in your cell phones. The three researchers found a way to speed up traditional measurement methods and make them applicable across multiple devices. The first prototype model was built in 2010 and it wasn’t long until the researchers realized that their innovation was unique. The researchers launched Dominion MicroProbes Inc. in 2011. In 2014, Cascade Microtech, the worldwide leader in design and development of wafer probing and systems, approached the researchers and offered to become the sole marketer and sale representative for their products and for Dominion to become its first MeasureOne partner – an exclusive new level of collaboration and partnership. The partnership has helped the researchers balance their academic duties with the company’s management. Two years ago, the company hired its first full-time employee, former Ph.D. graduate student Matthew Bauwens, to manage the day-to-day operations, improve probe performance and help create new products. In 2015, Dominion MicroProbes also joined forces with Lake Shore Cryotronics to develop a line of high-frequency wafer probes for use at cryogenic temperatures. The Edlich-Henderson Innovator of the Year Award is named for the late UVA Professor Emeritus Dr. Richard F. Edlich and Christopher J. (“Goose”) Henderson, a veteran of privately owned financial services businesses. The 2016 winners will be honored April 13 at the UVA Licensing & Ventures Group’s annual innovation award gala at The Paramount Theater. This year’s event is part of the Tom Tom Founders Festival. The innovators will take the stage for a public lecture at 6 p.m. The event is free and open to public.